Van-based MPVs have been around for years but the problem with these vehicles is two-fold – firstly, a lot of people don’t want to be seen driving a commercial vehicle and, secondly, some drivers are wary of their size. Driving a van isn’t like driving a car. It’s a lot more demanding, especially when trying to park in the tight spaces at Tesco. 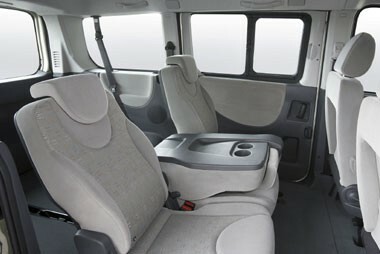 But Peugeot is aiming to banish at least some of these problems with the launch of the new Tepee people carrier. 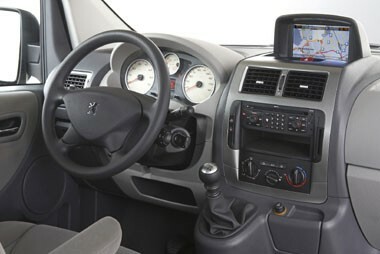 The Tepee may be an MPV version of the new Expert van but the whole package is based on the Peugeot 807. The firm will be hoping to attract chauffeur and fleet shuttle business. The Tepee is offered in two guises – long and short wheelbase – and with a 1.6-litre HDi turbodiesel engine offering 90bhp or a 2.0 HDi with 120bhp. Five/six seats are the norm, with a third row up for grabs as a paid-for option. There are two trim levels – Comfort and Leisure. Our test model was the long- wheelbase Leisure with eight seats and the higher-powered engine. The basic on-the-road price is £22,557. Forget your usual MPVs – this vehicle is BIG. Sit in the driver’s seat and look behind you and it seems as though you are staring into a long tunnel. This Tepee seats eight people – and that’s eight fully grown adults, not very short people and three contortionists. The front two seats are ‘captain’s’ variety with fold-down armrests. The driver’s seat offers adjustable lumbar support, which is a great plus for oldies like me. There’s acres of legroom for those second and third-row passengers and even with all the seats in place, there is still plenty of space for a pile of suitcases in the back. The second and third row of seats come out, if you fancy having a 20-minute wrestling match with them, and the cavernous interior is revealed in its full glory – no fewer than six cubic metres of space. In the front, the dash is straight from the Expert van – a chunky yet reasonably stylish affair – while the floor features proper carpeting in place of the Expert’s wipe-clean plastic variety. The HDi engine is the well-known and respected unit that graces many of Peugeot’s cars and vans and fires up with a muted thrum which doesn’t intrude in the cabin. On the road, the enormous length of the vehicle can soon be forgotten as the power steering is nicely-weighted (just on the heavy side) and the Tepee’s road manners are impeccable. However, it’s a different matter while trying to manoeuvre in tight spaces. As editor of Fleet Van magazine, I didn’t find it a problem but those new to the world of commercial vehicles could well find themselves in a spot of bother in some car park situations. The Tepee offers an awful lot of metal for the money. It eschews the pedestrian looks of some of its brethren and will provide faithful service both as a fleet car and as a lifestyle companion.